The process of chewing and swallowing foods is something we often take for granted until a situation arises that makes this everyday task difficult. Suggesting soft foods to our patients is commonplace for us; it is something we do everyday. But let’s face it, there’s only so much soups and smoothies and jello one can eat before you want to scream. Imagine then, being faced with a situation where you or a loved one is forced to change to softer foods long term. From mouth sores to congenital abnormalities to age-related issues, there are many reasons why a person may have to modify the types of foods they enjoy. And we sure enjoy our food. We look forward to our meals and want real food. Actually, there are many soft food choices that are limited only by our imagination and our ability to “surf the Internet”. Who knows when or if you may ever have a need for the list below. 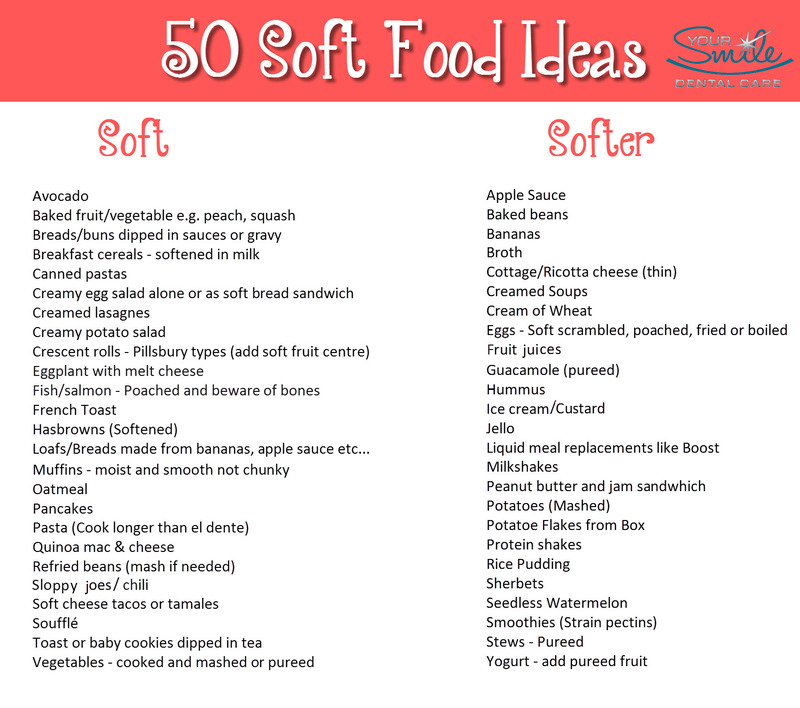 We encourage you, however, to keep this list handy and use it as a starting point to create tasty and nutritious soft food meals of your own! Anything that can irritate or is small enough to become lodged into surgery site. Additions: You are limited only by your imagination when choosing toppings for your foods. Melt cheese over foods. Add feta, peanut butter, syrups, and sauces. Modifications: Many recipes can be modified to include more healthy, nutritious alternatives. Soups: Leftovers can be easily pureed into soups. Add to potatoes to thicken and water/milk/broth to help liquefy. Slow Cooked Goodness: Your slow cooker is great to really soften and moisten recipes. 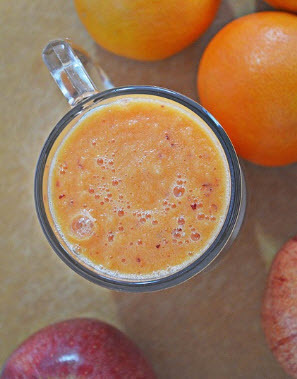 Smoothies: A great way to add vitamin and minerals. Strain any pectins/pits through a cheese cloth. Sandwich it! Try placing what you just made between two slices of bread. If the crusts are too hard just remove them. Blender Casseroles: Many recipes can be modified by placing the ingredients in a blender or food processor then baking as you would a casserole. Sprinkle with cheese near the end of cooking time. Cereals: We all know how quickly cereals can soften in the milk if left for a few minutes. Do a careful crunch test in your mouth with the first spoonful just to be sure. Instructions: Mix the ingredients together and pour into a sandwich or freezer (Ziploc) baggie. You can mix in a bit of food colouring if you want. Remove as much air as possible and seal. Place this baggie inside another baggie for added strength. Place into freezer for about 12 hours. We hope that this list helps and is something you can print to always have on hand so you can be prepared in advance. Good luck and remember to always consult your own dentist or doctor so they can advised you further based on your own “specific to you” circumstances.